Russia may produce more than 70 million tonnes of liquefied natural gas (LNG) per year in its remote Arctic regions, the head of gas producer Novatek said on Wednesday. "The Gydan and Yamal peninsulas have a vast resource base that allows the production of over 70 million tonnes (of LNG); it is comparable to LNG production in Qatar", Leonid Mikhelson, the head and co-owner of Novatek told a conference. Novatek, which was put on the list of Russian companies sanctioned by the West over Moscow's role in the Ukraine crisis, plans to ship its first liquefied gas cargo from the Yamal LNG plant in December, mainly targeting Asian markets. Mikhelson said construction of the first train of another plant, Arctic LNG-2, would be completed in 2022-2023. The new plant is designed to liquefy gas from the Gydan peninsula - the province next to where Gazprom, the world's largest gas producer, also holds gas deposits. Mickelson said he was willing to forge an alliance with Gazprom to produce gas in the Arctic. Previously, Novatek had talks with Gazprom about buying gas fields in Yamal. "I would welcome partnerships like that. A lack of attention is paid to gas monetisation (at Gydan and Yamal)," he said. Output at the Arctic LNG 2 plant will be "the same as at Yamal LNG plant or a bit higher", Mickelson added. Yamal LNG plans to produce 16.5 million tonnes of LNG and 1.2 million tonnes of gas condensate per year by 2019. 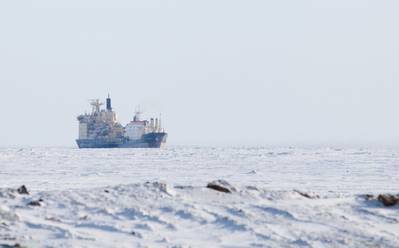 Novatek may sell as muсh as 49 percent in Arctic LNG-2 to foreign investors, but that would depend on the amount of extra funds new shareholders would provide and the volumes they could buy, Mikhelson told reporters on the sidelines of the conference.